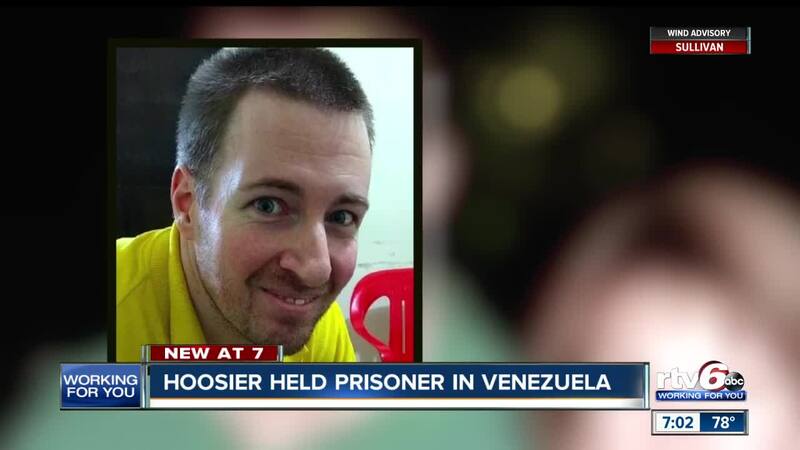 Hoosier held prisoner in Venezuela. BLOOMINGTON — Todd Leininger went to a South American country as a tourist and was taken prisoner. His mother hopes political and humanitarian pressure will allow her son to return home to Monroe County. Leininger, who hasn't been home in five years, is being held captive in Venezuela, a country in economic and political crisis. The Hoosier went to visit the country with his wife and was arrested, accused of trying to overthrow the government and spying for the United States. That was in 2014. On Wednesday, the Bloomington man was the focus of a U.S. Senate committee hearing. In the hot seat was Secretary of State Mike Pompeo. "We are still having conversations with a broad range of Venezuelans working diligently to try to make the case to get every American returned home," Pompeo said. Leininger's family created a Facebook page called, "Bring Todd Home." After numerous attempts to make that happen, the efforts have not led to a positive outcome. Indiana Sen. Todd Young said he also reached out to the President and Vice-President. Both have condemned the current Venezuelan president and support his replacement. The political and economic situation are complicating matters. "It does complicate matters, without question," Young said. "We pulled the diplomats out of Venezuela because we feared for their safety in recent days. One of my most fundamental responsibilities is to do whatever I can to and pull out every conceivable measure to try to see that this Hoosier is returned back home safe and secure. "We're not going to give up on this. We know that this is a challenging situation and we'll work on this." Leininger's mother said she just wants the United States government not to forget about him and to bring him home. A court ordered his release last year, but Leininger remains behind bars.